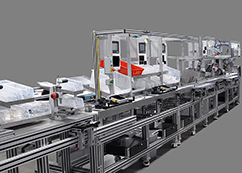 Manual, Semi-Automated or Automated: What Type of Assembly System is Right for You? | Invotec, Inc.
Manual, Semi-Automated or Automated: What Type of Assembly System is Right for You? When choosing an assembly system for your manufacturing process, there is a wide spectrum of solutions between manual, semi-automatic and automatic. If you’re unfamiliar with automation, it can be difficult to determine which way to go. We frequently get approached by potential customers that tell us, “My boss told me I need to automate.” The problem is, automation may not be the right solution for your manufacturing process. It’s important to understand the goals for the product you’re assembling and how you can justify the costs associated with its process improvement. Here are some questions to ask yourself when choosing an assembly system. What types of assembly systems are there? True manual assembly systems are typically individual workbenches for each stage in the assembly process. The product gets passed manually from station to station singularly or in batches. However, there are many variations to manual assembly. For example, you could also use a singular assembly line with a manual transfer conveyor. In this case, workers stand at a specific station along the line and manually push the product down the line as its being assembled. This is usually done in lower volumes rather than production runs. Semi-automatic systems are probably the broadest part of the assembly system spectrum. These can include the smallest help from an operator, such as manually loading and/or unloading the entire system. Or it can have a great deal of labor, such as having manual checks at every station to allow an automated conveyor to continue down the assembly line. The key for this assembly type is that it includes both manual functions as well as machine-aided assembly. At INVOTEC Engineering, we see fully automatic systems as solutions that require no human interaction. This means the product is loaded into feed systems or can be transferred from another system that will automatically load into the next step of the assembly process. The automated system then completes the entire assembly including testing, inspection and unloading. If there is human interaction, it can be as simple as responding to system prompts. How do you know which one is right for your manufacturing process? When choosing an assembly system your budget and volumes largely dictate which type will work best for you. At INVOTEC, we recommend our customers complete a return on investment calculation first to determine the balance between cost and features for them and their assembly system. This will lead them towards a solution that meets their budgetary needs over the life of the machine as well as their manufacturing goals for the product. You can read how to work through this process here, Changing Your Manufacturing Process: How Much to Invest. With that being said, each assembly type can be appropriate for different manufacturing goals. Manual assembly systems, for example, are often used when a company wants to make their system more efficient, less cumbersome or reduce ergonomic issues for their workers. These systems could include newly designed fixtures or slight process changes. Manual assembly systems typically don’t lend themselves to a large increase in production or a significant decrease in rejected material. We also see many companies use manual assembly systems when their products don’t lend themselves to automation. This could be due to an intricate sequence in the assembly system, or a part that has a specialized function or shape. In these cases, manual assembly could be the manufacturer’s only option. Semi-automatic systems are useful for companies that need to improve their manufacturing process, but aren’t able to completely remove the operator assistance. The products used in these systems can benefit from some automation, but some aspects of the assembly are too difficult to fully automate reliably. This can be because the incoming parts can’t be economically fed, or the volumes don’t justify a fully-automatic system. Many companies go with this option to realize the significant process improvements while retaining the adaptability of an operator’s input. Fully automated systems are often used for companies that are looking to increase the production of a product that lends itself to automatic feeding and assembly and whose volumes require throughput increases. These companies typically already operate automated equipment in their facilities, and they are looking to keep long-term costs low by not hiring more laborers. Many companies will suggest that manual assembly is less expensive than automated assembly. However, when you consider the longer-term payback on your machinery, automation could be more economical for your company. Does assembly type dictate who I should work with? Yes. Not only will you need to decide what type of assembly system you need, you’ll also need to find the right equipment builder to help you develop the solution properly. There are some companies that specialize in manual assembly equipment. They make fixtures and stand-alone stations. This would be a good choice if you know you are going to stick to manual assembly for the next several years. Similarly, an automation provider is used to completing fully automated systems for large manufacturers. They would struggle to give your manual fixture or station the attention it needs without recommending extra features that an automated machine would give you. Ultimately, they might be predisposed to more automation than you may need. The best equipment builder for a company that is unsure of which approach is best for them is a partner that offers a full range of solutions. These companies will be able to work with you to determine the best solution for your manufacturing goals and scale the project to your specific needs. Here’s an article that might be helpful in how to choose the right manufacturing partner. Assembly systems can be a complex decision. If you are considering automation for your process, there are numerous things to consider and you may be nervous to make this decision on your own. Do the research before you choose a solution, and be sure to find a custom equipment builder that you can trust to help you find the best solution for your needs.